OSHA’s Fall Protection Standard (1926.501) is once again the agency’s most frequently cited standard, according to a post today by The National Safety Council's Safety+Health magazine. Finalized data, along with additional Top 10 details and exclusive content, will be available in December. 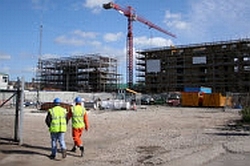 One of the biggest problems facing any construction site is security. Construction Equipment Guide reports that theft from construction sites costs companies between $300 million and $1 billion annually. Threats include employee theft, as well as trespassers looking for tools, equipment and materials to pilfer. Security guards have taken on this challenge in the past, but now new security technologies can help keep construction sites secure from theft - and help protect employees, too. Virtually indestructible and built to withstand the harshest of weather conditions, RFID tags are ideal for construction sites. RFID scanner and tracking systems use radio waves to transmit data from tags to a reader. Users place an RFID tag on an item, scan it, and then track it through the integrated software. With unique tags, users can track tools, equipment and machinery to ensure resources don't leave the job site without permission. Even safety harnesses can be chipped, allowing users to track employee activities on-site and provide safety checks, in addition to equipment control. When properly installed and utilized, RFID systems can help contractors identify thieves, recover lost equipment and even schedule and track maintenance. Drive Safely Work Week (DSWW) is the Network of Employers for Traffic Safety's annual workplace safety campaign, providing an opportunity to remind employees about safe driving practices. Organizers have prepared a complete kit of materials that are available for free download. Learn more about DSWW. WorkSafeBC has launched a new mobile application to help agricultural employers keep track of confined spaces on their properties, including dairy farms, orchards, mushroom operations, greenhouses and ranches. The My Confined Spaces app allows users to create an inventory using a map, log information and photos for each confined space, and record possible hazards. Users also can view potential hazards for common confined spaces and share their inventory. A resource library in the app contains documents, videos, tutorials and other resources. Learn more. Preliminary numbers from the Bureau of Labor Statistics show a total of 4,679 workers died on the job in 2014, an increase of 2 percent over the revised count of 4,585 fatal work injuries in 2013. The preliminary rate of fatal work injury in the U.S. in 2014 was 3.3 per 100,000 full-time equivalent (FTE) workers; the revised rate for 2013 was also 3.3. Mining, construction, manufacturing, law enforcement and agriculture experienced significant increases in fatal injuries in 2014. Fatal falls, slips, and trips rose by 10 percent from the previous year. Transportation-related fatalities also increased slightly. Construction deaths rose by 6 percent to 874. The number of fatal work injuries in private goods-producing industries in 2014 was 9 percent higher than the revised 2013 count but slightly lower in private service-providing industries. OSHA released details on 12 significant fines in August, with total proposed penalties of $4,559,540. That's quite a jump from the $2.9 million of serious fines (over $100,000) issued in July. The top 5 penalties accounted for more than three-fourths of the August total, including $1.8 million of proposed penalties against a pair of Illinois construction firms. Here are some details of August activity, many of which are still pending final decisions. During renovation of a former elementary school, two Illinois construction companies violated numerous OSHA health standards related to the dangers of asbestos. The companies now face a total of $1,792,000 in penalties and entry to the Severe Violator Enforcement Program (SVEP) for willfully exposing at least eight workers to asbestos. The investigation also found management brought non-English speaking workers to the U.S. and threatened them with termination if they spoke with OSHA inspectors. Investigation of an Ohio chicken processing facility found that the company was aware of dangers, but continued to expose workers to serious and potentially fatal injuries. Acting on a referral, OSHA cited the company for two willful, 20 repeat, 30 serious and three other-than-serious safety and health violations. OSHA assessed $861,500 in penalties and added the company to the agency's Severe Violator Enforcement Program. September has been National Preparedness Month, a time to plan ahead for the unexpected emergencies that can devastate families, businesses and communities. Everyone is invited to participate in America’s PrepareAthon! and the national day of action, National PrepareAthon! Day, which culminates National Preparedness Month on September 30. Many workers are called to spend time alone in unfamiliar, potentially dangerous environments, from site inspections to confined spaces to home healthcare to real estate open houses. The Canadian Centre for Occupational Health and Safety has assembled some tips to help keep workers safe when they are alone or off-site. Prepare a daily work plan so everyone knows where and when off-site employees are expected somewhere. Set a check-in procedure requiring off-site employees to check in periodically. Know when and who to call for help if they do not. Provide training on how to recognize and avoid potentially violent situations, as well as conflict resolution and mediation skills. Use a "buddy system" in high risk situations - make sure employees know this option is available to them and when to use it. Provide information on high risk geographical areas. Limit the time of day visits can be made to high risk areas/clients. Keep client records and ensure staff are aware if a client is known to be aggressive, hostile or potentially violent. Burns are the most obvious hazard associated with welding and brazing, but there are many others. Eye protection from radiant energy as well as flying debris are critical, but don't stop there. Welding fumes have been connected to nervous system and kidney damage, as well as stomach ulcers. Fires and explosions are risks, and don't forget to consider the safety of workers in adjacent areas. A recent article shared by the safety experts at Safety Management Group explains these processes, examines the dangers associated with them and discusses steps that can be taken to reduce these hazards. Visit the OSHA Welding Brazing and Cutting page. Browse welding safety signs and labels. Hand Washing signs in ANSI, OSHA and standard sign formats to encourage employees, customers and visitors to practice good hand hygiene. The signs feature graphic symbols, hand washing instructions and various reminders for locations including medical facilities, restaurants, schools, daycares, restrooms, labs, animal exhibits and much more. High Visibility Vest signs and labels in OSHA and ANSI formats to remind workers of high visibility vest and other PPE requirements to help keep them safe on the job. Portrait-orientation Safety Signs and labels may meet your needs better than traditional horizontal signs. We now offer vertical signs on a wide variety of topics, including industrial notices, recycling, hazmat, food handling, machine safety and more. These signs are available in six sizes, from 5x3.5-in. labels to 28x20-in aluminum or plastic signs, and also with magnetic backing. See all the new signs here. The Network of Employers for Traffic Safety (NETS) has launched an online toolkit to help employers plan ahead for Drive Safely Work Week 2015 (DSWW), the October workplace campaign to improve the safety of employees, employee family members and their communities. The free DSWW toolkit provides easy-to-use Web-based resources, including facts and tips, downloadable graphics, and activities tailored to help drivers be at their best behind the wheel. 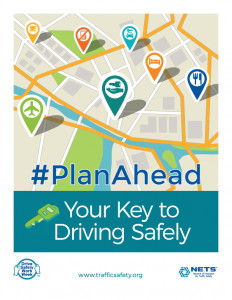 The theme this year is Plan Ahead - Your Key to Driving Safely. Materials underscore that planning may be the most critical leg of any driving trip and offers resources to help become a better planner for both business and personal travel. "Planning is critical to safe driving from many different perspectives," said NETS Chair Joe McKillips. "It can be as simple as planning the best route. Other times it can mean planning for a designated driver, setting aside time with your teen driver to practice or talking to an older family member about the possibility of limiting their driving. These considerations and more are covered in this year's campaign materials." In addition to materials directed to all employees - whether they drive for work or just to and from work - the toolkit includes resources to assist management in development of guidelines and policies as related to safe driving. The campaign was developed using the expertise of NETS' member companies, collectively representing a fleet of more than half a million vehicles that travel in excess of 11 billion miles globally each year. Held annually since 1996, Drive Safely Work Week is officially observed during the first week of October. However, the materials are not dated and may be used anytime throughout the year. Over the past several years, an average of 3,500 organizations have participated annually, representing 16.5 million employees per year. Download the free DSWW toolkit. Visit the NHTSA Driving Safely page. Review employer resources about distracted driving. Review accident guides and relevant laws by state.